The impact of social media on American daily life cannot be overestimated. While businesses and schools make use of social media as a tool for conducting transactions or for learning, social media also gets in the way as employees and students check their inbox to see if anyone from their crew has a funny story to share. The relationship between affluent investors and their financial advisor also changed the day social media was invented. Today, advisors and financial providers are almost required to have a social media presence in order to attract new business and maintain current relationships. The role of social media in investing and finance is examined thoroughly in Spectrem’s quarterly wealth segmentation study Using Social Media and Mobile Technology in Financial Decisions. Investors from three different wealth segments discuss the social media sites they use, the frequency with which they use them, and how they use them to access financial and investment information. Advisors must guard against underestimating the role social media can play in the current investor relationships they have and the potential for future investor relationships as well. Not all investors participate in social media, and there are probably conversations in financial provider offices about balancing the message sent via social media with the message sent through more traditional channels such as publications and television advertising. 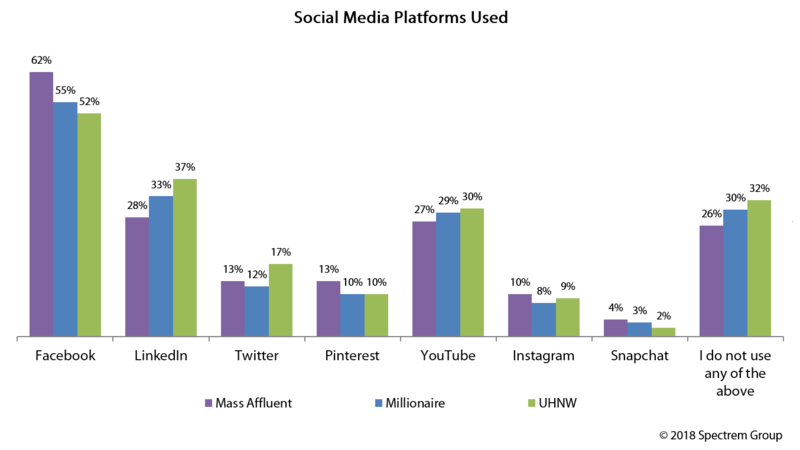 But the Spectrem study shows that 55 percent of all Millionaires, with a net worth between $1 million and $5 million (not including primary residence) use Facebook, and 33 percent use LinkedIn. Almost 30 percent use YouTube, although only 12 percent use Twitter. The percentages for usage of Facebook and LinkedIn have dropped from 2016, while usage of Twitter and YouTube have remained constant. The study segments investors by age (and several other categories), and advisors should note that 73 percent of Millennial Millionaires use Facebook, 62 percent use YouTube, and 46 percent visit LinkedIn and Twitter. These are all sites which advisors and firms could use to get their message across about investment strategies and up-to-date financial news while also advertising their services, and Millennials, the newest demographic of affluent investors, are on those sites and looking for information. Almost two-thirds of Millionaires have a primary financial advisor, and of those investors, 63 percent access their financial advisor’s page on Facebook, while 50 percent are linked to their advisor on LinkedIn and 23 percent follow their advisor on Twitter. People who link to social media pages from other people or organizations are looking for information which will intrigue them, and these investors are all connected to their financial advisor through social media sites because they think it will be useful to them at some point. But does social media posting lead to new business? That’s for advisors to determine when they interview new clients, but according to the Spectrem study, 9 percent of Millionaires said they would look at how an advisor uses social media to communicate with consumers when choosing a new advisor. Resistance is not only futile, it’s counter-productive. Any blog or article posted on a social media site is an invitation to interact with current clients. Prospective clients are going to examine your firm’s social media offerings to see if you have a modern sales and information approach. And it’s free advertising, unlike print or TV ads. It’s silly not to take advantage of the fact that so many people peruse social media dozens of times a day. You might just catch someone who is wistfully skimming information sites to find a new financial advisor. There are indeed compliance issues which advisors must consider in social media posts, but any informational videos or articles you post, which do not carry with it a recommendation of any sort to a special product or service, are generally fair game. Although it is not frequently employed, social media also allows investors to communicate back to their advisor when they read something that triggers a thought related to investment.